Monte Cook's "Temple of the Half-Born" - Asked for help by a strange old man, you travel underneath a massive cemetery to investigate and root out the evil that lurks below. Delve deep into the temple to meet demons, hybrid ghouls, cadaverous projects gone wrong, and the mastermind behind it all. This is an adventure for 7th or 8th level characters. Brian Cortijo's "Arena of Souls" - You've been abducted! Fight your way through the arena and find a way to escape. Beware! You start out weaponless and imprisoned. The tiefling priest warden is more than he seems; he is providing entertainment for perverse locals and the arena has an even more sinister purpose. Time for a jailbreak! An adventure for 3rd or 4th level characters. Ed Greenwood's "Lost Coins and Flying Bones" - Many years ago a group of merchant traders met a very sticky end. Rumours have circulated for decades about the wealth and magic held within the trader's storage cellars below the city. You have learned the location of the only entrance to those cellars. What does it contain? Goods, wealth, magic? Will you live long enough to find out? An adventure for a 5th to 6th level party. Steven Schend's "Keep Away From the Borderlands!" - It has been two nights since Corith's Watch, a holy night that occurs only once every 120 years. The full moon glowed blue and strange things happened. People have disappeared.Blue fires rage across the wilderness. Some people have not been heard from since that night, including the guards at the local watch post. You have been hired to investigate what happened at the keep! A first level adventure. 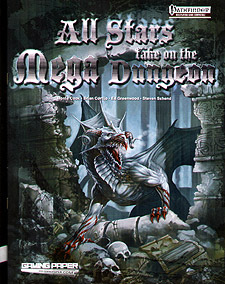 All Stars take on the Mega Dungeon is a collection of four adventures by Monte Cook, Brian Cortijo, Ed Greenwood, and Steven Schend with stunning artwork by Joel Biske and Dan Houser. This adventure is compatible with the Pathfinder Role Playing Game and Gaming Paper Adventures: Mega-Dungeon 1.